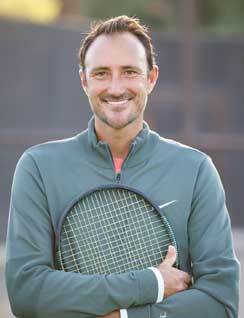 Nathan Welden has been a certified USPTA teaching pro since 1999. Over the years, Nathan has taught thousands of kids, juniors, and adults of all ages and abilities in San Diego. Nathan was a successful high school coach for 15 years at Grossmont and West Hills High Schools. In addition, Nathan was the director of Youth League Tennis for many years. 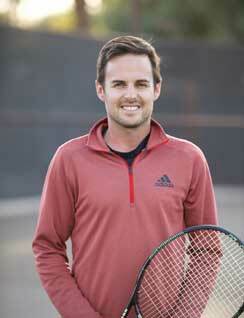 Currently, Nathan runs Junior-Adult programs at Lake Murray Tennis Club with Teaching pro Stephen Thom. Nathan and partners Megan Haber (Women's Grossmont College Coach) and Stephen Thom run Fletcher Hills Tennis Camp every summer at Grossmont College. Nathan's a huge advocate of 10 and under tennis. Contact Nathan to reach your tennis goals; whether it's improving a specific stroke or finding you a class that you can look forward to each week. Steve has been a USPTA certified teaching professional since 2006. He received a Bachelor’s of science degree from Sonoma State University in kinesiology and continued his education to receive a Master’s degree from Oregon State University in Exercise Science. Steve has been teaching at Lake Murray Tennis Club since 2013 and runs a variety of junior and adult programs with fellow teaching professional Nathan Welden. Session-based clinics consist of 10 and under tennis, competitive junior levels, and 2.5-4.0 level adult clinics. He is the co-owner of Fletcher Hills Tennis and is actively involved with growing tennis in the greater San Diego area though summer camps and school-based tennis programs. Steve is on the HEAD/PENN tennis advisory staff. Steve lives in San Carlos with his wife Sydney and son Gavin. He is also a part-time adapted physical education teacher for the Santee School District. Call him today to improve your game. 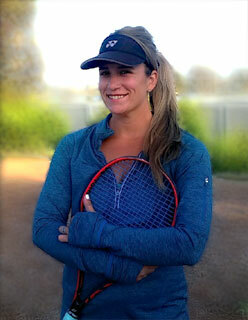 Danielle is USPTA certified with specialty in health and nutritional sciences. Offering Cardio Tennis classes and private/group lessons. She was born and raised in San Diego and graduated from Patrick Henry High School, where she won three league championships. After playing softball at San Diego State University, she decided that tennis was better suited for her. Danielle played for the Lady Griffins at Grossmont College, where she led her team to a state championship and was awarded female athlete of the year. Danielle later went on to graduate from SDSU with a bachelor’s degree in Kinesiology. With her background in fitness, and wealth of tennis knowledge, she will help you achieve that competitive edge you‘ve been looking for! Elden has coached at LMTC for 3 years, assisting teaching both youth and adult tennis classes with Nathan Welden and Steve Thom and is a member of the club. 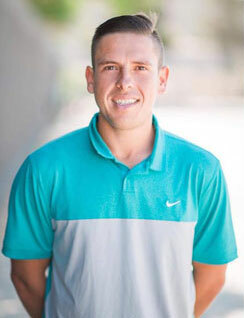 He graduated from Simpson University with a bachelor’s degree in communication on a baseball scholarship.. Nathan Welden was his youth tennis coach and as a summer job during college, he would hire Elden to work his summer tennis camp. After college he began teaching classes with Nathan and Steve as a transitional job at the time, and ended up falling in love with coaching and working with kids. From there he decided to get his teaching credential in physical education as well as become a certified tennis pro. Along with teaching classes at LMTC,He ran a tennis enrichment program at Green Elementary in 2017, where he taught every student at the school grades 1 through 5. He is looking forward to meeting and getting to know the LMTC community. Ideal for young beginners, this clinic is designed for players interested in learning the basics. The class will focus on ball control, footwork, and rallying on the small (36 foot) court. Ideal for advanced players looking to get involved in competitive tennis. Class focuses on fitness, competitive drills, and singles and doubles strategy. This clinic is ideal for young athletes with basic strokes whom are able to rally on the 36- foot court (red ball) and 60-foot court (orange ball). Class focuses on ground strokes, volleys, serves, score keeping, and singles and doubles strategy. Class focuses on fundamentals with the green ball and yellow ball. This clinic is designed to prepare players for high school tennis with an emphasis on doubles play and serving. Class is intended for students ages 11-14 that are newcomers to tennis. Students will learn all the fundamental strokes as well as learn how to properly keep score and play doubles. Regardless of experience all students are welcome, with the overall goal of the class to create a lasting love and enjoyment for the sport. This clinic is offered to competitive high school players and will focus on competitive games and drills preparing athletes for singles and doubles play. This	clinic	is	offered	to	adult	3.0-4.5 level	players. With	4	courts	of	drills,	competition,	strategy,	and	game	play,	we	will	find	the	group	to	fit	your	playing	level. Come	out	to	the	club	to	meet	fellow	players and	further	grow	our	local	tennis	community. Looking to get back into tennis? This is the clinic for you! We will focus on stroke production, movement, drills, and fun social games. Come out and meet your local tennis community. Ideal for competitive players looking to improve their doubles and singles play. Come out and meet other players from the club and in the community.